Ptosis is a drooping of the upper eyelid. The lid may droop only slightly, or it may cover the pupil entirely. In some cases, ptosis can restrict and even block normal vision. It can be present in children, as well as adults, and is usually treated with surgery. Our doctors at Utsav Eye Clinic are fellowship trained and experienced for treatment of drooping of lids in Navi Mumbai. Ptosis which is present at birth is called congenital ptosis. If a child is born with moderate to severe ptosis, treatment is necessary to allow for normal vision development. If it is not corrected, a condition called amblyopia (lazy eyes) may develop. If left untreated, amblyopia can lead to permanently poor vision. Congenital ptosis usually does not improve with time. The most obvious sign of ptosis in children is the drooping lid itself. Children with ptosis often tip their heads back into a chin-up position to see underneath their eyelids, or they may raise their eyebrows in an attempt to lift up the lids. Over many years, abnormal head positions may cause deformities in the head and neck. 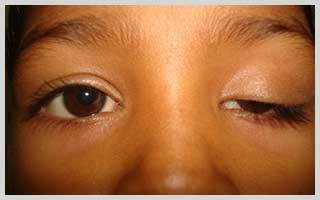 What problems can result from ptosis in children? The most serious problem associated with childhood ptosis is amblyopia (“lazy eye”). Amblyopia is poor vision in an eye that did not develop normal sight during early childhood. This can occur if the lid is drooping severely enough to block the child’s vision. More frequently, it can occur because ptosis tends to change the optics of the eye, causing astigmatism. Finally, ptosis can hide misaligned or crossed eyes, which can also cause amblyopia. If amblyopia is not treated early in childhood, it persists throughout life. How is congenital ptosis treated? observation of the eye’s movements. During surgery, the levators, or eyelid lifting muscles, are tightened. In severe ptosis, when the levator is extremely weak, the lid can be attached or suspended from under the eyebrow so that the forehead muscles can do the lifting. Children with ptosis, whether they have had surgery or not, should be examined annually by a pediatric ophthalmologist for amblyopia, refractive disorders, and associated conditions. Even after surgery, focusing problems can develop as the eyes grow and change shape. To read more about treatment of drooping of lids in Navi Mumbai, click here….